The Produce Green Foundation is a non-profit charity entity promoting organic farming and sustainable living. Founded in 1988, the organization’s mission is to provide education on healthier, safer food based or more natural food production and environmental preservation concepts. The non-profit is a member of: the Hong Kong Council of Social Service, the Hong Kong Organic Farming Association and the International Federation of Organic Agricultural Movement. - and the establishment of an organic certification system (local). The organization supports the Hong Kong Organic Farming Association’s Organic Resource Center and its organic certification system. They hope to make organically grown produce more mainstream in the future. Produce Green’s HK organic School and Community Network (HKONE), along with other gardening seminars and freely distributed organization sponsored publications targets schools to promote organic community gardens. Farming courses for campus tutors are also offered. The non-profit shares it vision through eco-tours and environmental educational activities at its central site. Visitors can enjoy guided tours, a “green” eating workshop, sustainable living lessons and other special activities. 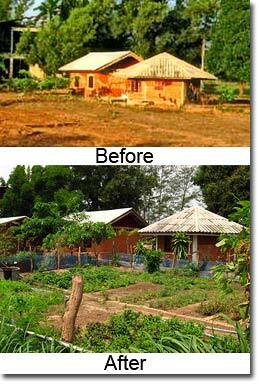 To further its organic farming vision and sustainable living principles, the organization needs your donations to continue with its educational initiatives and courses, as well as acquire more property for organic farming. You can also become a member to avail of special benefits and privileges. Click here for more information.